Trigence Semiconductor to demonstrate digital micro-speaker modules (DSMs), developed in conjunction with Intel Corporation, that consume significantly less active power than required by traditional analog speakers. The DSMs simplify the audio output path, remove high-voltage amplifier rails and components, and extend battery life in portable devices through a combination of Trigence’s Dnote® digital amplifier technology with multi-coil micro-speakers from AAC Technologies. Trigence Semiconductor today unveiled the latest demonstration of Digital Speaker Modules (DSMs), providing a blueprint for OEMs, ODMs, and system integrators to incorporate the value of state-of-the-art digitally-driven micro-speakers in Ultrabooks, tablets and smartphones. These ground-breaking DSMs match the performance of the best traditional analog amplifier solutions, while reducing the active power requirement of the audio output stage to as little as 30% of a comparable analog D-Class amplifier driven solution. DSMs both extend battery life and simplify the system-level architecture, requiring routing and consideration of only digital signals, operating from a single 5V supply rail, and needing no high-voltage components in the support circuitry. By combining Trigence Semiconductor’s patented Dnote® digital amplifier IC solutions with micro-speakers from AAC Technologies containing 6 voice-coils, in a thin tablet form-factor, the DSMs are able to achieve sound pressure levels (SPL) exceeding 87dB at typical listening positions. The DSM demonstration system was developed in conjunction with Intel Corporation, and incorporates SoundEdge Technology from Sound Research Corporation. 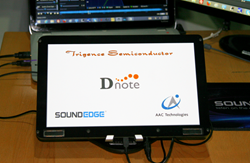 Trigence Dnote® technology utilizes specially adapted delta-sigma techniques to overcome manufacturing mismatches in the speaker voice-coils whilst driving only the number of coils necessary to achieve a given dynamic SPL requirement. The result is a high fidelity audio output that consumes as little as 30% of the battery power needed by traditional output stages. Using DSM’s enables OEMs, ODMs and system integrators ignore the complexities of creating a compelling audio experience. The DSMs are simply fed audio data through the most readily available digital format (e.g. I2S), and the DSM takes care of the rest (including audio equalization). DSMs require only a single 5V or higher supply rail, and are independently addressable at the system-level. Prior to DSMs, system designers were required to develop, test and refine a dedicated audio amplifier and conditioning PCB based on analog D-Class amplifier solutions. These audio boards typically need multiple power rails or boost-supply circuits, and incorporate a mix of expensive high-voltage components. Significant care is needed in the routing and shielding the analog signals on such boards in order to minimize EMI and maintain an acceptable audio experience. The Digital Speaker Modules will be on display during Computex inside the Intel Capital suite at the Taiwan International Convention Center (TICC). To request a private meeting and demonstration, please contact Koichiro Ochiai at, ochiai(at)trigence(dot)co(dot)jp, or sales(at)trigence(dot)co(dot)jp. Founded in 2006 as a spin-off from Hosei University and headquartered in Tokyo, Japan, Trigence Semiconductor is a privately held company invested by Intel Capital and INCJ (Innovation Network Corporation of Japan). Our mission is to develop and deploy semiconductor solutions tailored specifically for the truly digital nature of today's latest audio equipment and consumer devices. Trigence is the inventor of the revolutionary Dnote® (or Digital Note) digitally-driven speaker system, a new and entirely digital audio output solution implementable on any generic bulk CMOS process. Dnote® delivers clear and precise audio output signals and typically consumes less than one third of the power of legacy output architectures. Trigence was the recipient of the Award for Excellence for its work on Dnote® at the Tokyo Venture Technology Awards 2013. *Dnote® is a trademark of Trigence Semiconductor in the United States and other countries. For more information, contact: Koichiro Ochiai - ochiai(at)trigence(dot)co(dot)jp.